After he completed 2013’s Behind the Candelabra, Steven Soderbergh announced his retirement from filmmaking. To the surprise of no one, this didn’t take, so Soderbergh comes back to movies with 2017’s Logan Lucky. Single father Jimmy Logan (Channing Tatum) struggles to stay afloat and maintain an active role in his daughter Sadie’s (Farrah Mackenzie) life. This becomes more complex when his ex-wife Bobbie Jo (Katie Holmes) announces her intention to relocate, a change that will further keep Jimmy from his daughter. Jimmy also loses his job at the Charlotte Motor Speedway, and that leads him to devise a heist intended to help push his life onto a better financial path. Along with his brother Clyde (Adam Driver), he concocts a scheme to steal gobs of cash during a major race – one that hits various snags. With Lucky, Soderbergh makes a film that draws inevitable comparisons with his past. While not a remake, Lucky bears an unmistakable resemblance to Soderbergh’s Ocean’s films. Those obvious connections aside, Soderbergh does enough to make Lucky into its own film, so don’t expect it to seem like self-plagiarism. Soderbergh changes the tone from his earlier flicks to give Lucky a distinct vibe. Still, I won’t blame you if you see Lucky as “Redneck Ocean’s”, and the Deep South side of things becomes a minor liability. Face it: as hard as Hollywood tries, it tends to condescend to Southern characters. Soderbergh doesn’t go over the top in that regard, but the film does come with some of the usual cornpone tropes. Nonetheless, Soderbergh imbues Lucky with a nice energy that makes it breezy and fun. 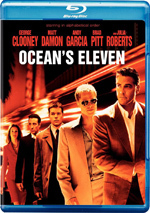 The movie lacks the flash and sizzle of Ocean’s 11, but it turns into a lively little adventure anyway. A fine cast helps. Lucky lacks the “A”-level group amassed for Ocean’s, but at the very least, it gives us a “B+” set of performers. In addition to Tatum, Driver and Holmes, we find Daniel Craig, Hilary Swank and Seth MacFarlane, among others. Again, this group doesn’t match up with the collection of superstars in Ocean’s, but it becomes a fine cast nonetheless, and all involved add depth and charm to the proceedings. Nothing about Logan Lucky stands out as stellar, but it does everything it needs to do to turn into a fun romp. A likable riff on the caper flick, this one becomes a winner. Logan Lucky appears in an aspect ratio of approximately 2.40:1 on this 4K UHD Disc. This became a terrific presentation. Sharpness worked well, for the movie exhibited consistently positive accuracy and clarity. If any softness occurred, I missed it, as the image looked exceedingly well-defined. No issues with moiré effects or jaggies materialized, and I detected no edge haloes. Source flaws also failed to materialize. Steven Soderbergh often opts for stylized palettes, and that was the case here, though he imbued Lucky with Hollywood Standard Teal and Orange. As unambitious as these choices were, the disc reproduced the hues in an appropriate manner, and when we got other tones – like purples or reds – they really popped. Blacks appeared deep and dense, while shadows looked smooth and concise. Everything about the image succeeded. As for the film’s DTS-HD MA 5.1 soundtrack, it opened up on occasion, mainly during scenes at the speedway. Those used the bouts of racing as well as some explosions to deliver an engaging, vivid sense of the material. Otherwise, the mix tended toward general atmosphere, and it did so in a positive manner. Music used the speakers in a fulfilling manner, while various environmental elements fleshed out the spectrum in a logical way. Audio quality satisfied, with speech that seemed natural and concise. Music appeared vivid and lively, with good range. Effects worked well, as they came across with nice fidelity and accuracy. Those elements boasted good low-end when appropriate. None of this turned into a dazzling soundtrack, but it seemed more than acceptable for the story. How did the 4K UHD compare to the Blu-ray version? Audio remained identical, as both discs offered the same DTS-HD 5.1 soundtracks. Visuals differed, though, as the 4K gave us a boost. In particular, definition seemed tighter, and colors offered more punch. As good as the Blu-ray looked, the 4K worked better. This package includes a Blu-ray copy of the film, and that’s where we find two Deleted Scenes: “Pro/Con” (2:44) and “Tap Dancing” (1:09). “Con” looks at Joe Bang’s decision-making process, while “Dancing” shows the inmates as they delay hostage negotiations. Both seem adequate but inconsequential. The Blu-ray opens with ads for Breathe, American Made, Atomic Blonde and Brad’s Status. No trailer for Lucky appears here. Logan Lucky feels like an odd choice for Steven Soderbergh’s return to filmmaking, as a caper flick like this doesn’t seem like something he’d find irresistible. That said, the movie does delight and entertain, so it achieves its modest goals. The 4K UHD offers excellent visuals and satisfactory audio but it skimps on supplements. I enjoy this fun romp, and the 4K UHD brings us top-notch picture quality.